In March of 2009, after having fought an off and on battle with cancer for over a decade, the disease had spread to the brain of Stefanie Spielman. The new treatments which needed to begin had affected her even more severely than the numerous rounds of chemo therapy which she had endured over the years. It left her drained and dizzy. Her husband Chris had to take on more responsibilities around the house, things which had usually fallen on Stefanie, like paying bills, cooking meals, and helping to organize the schedules of their four kids. The family prepared to have a celebratory dinner after the radiation had finished, but this was cut short when Stefanie suffered a fall. After doing a few tests at home, she was taken to the hospital. The cancer had spread to her spine. She was referring to his ability to run a household as a single parent. It’s one several places in the book where it’s easy to get choked up. It’s a moving story of Stefanie’s grace and spirit, of the love between Chris and Stefanie, and of a bold faith in God’s providence and in the unique purpose that the Spielman’s were able to accomplish. Stefanie was diagnosed with breast cancer in July of 1998. At the time, Chris was preparing to return to the Buffalo Bills after his 1997 season had been cut short due to a neck injury. Aware that his wife would be undergoing chemo therapy throughout the season, he decided to take a year off of professional football to be with his family. In the book, Chris writes that from that moment, it became their mission to make this battle public and to try to help others. Soon, the grocery store chain Big Bear approached the Spielman’s about creating a fund named after Stefanie at Ohio State’s James Cancer Hospital. The initial goal for the Stefanie Spielman fund was to raise $250,000 by the end of the year. Now, 14 years later, the fund has raised more than $10 million. Much of the first half of the book focuses on Chris growing up with the singular focus of becoming a professional football player, and how all of his energy was aimed towards that goal. I feel that was appropriate. 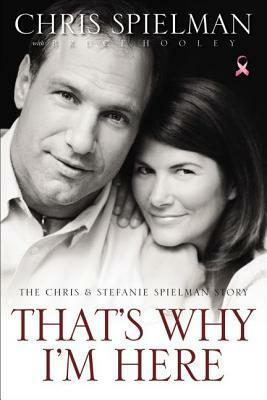 Chris Spielman the football legend is a key to the story. His accomplishments on the field were a major factor in the Spielman’s high profile and their unique opportunity to fight this battle in a way that would bless so many. When the story gets to Stefanie’s battle with cancer, for me, the book became impossible to put down. It’s not a sob story. Not by any means. The book has tremendous highs, such as the births of two children after the initial cancer diagnosis and of Stefanie’s unquenchable passion for life. The story also tells of cancer relentlessly recurring over the years until she finally succumbed to the disease in November 2009. In 2009, as the cancer was making it’s final advances, Stefanie was forced to miss a few events which she had annually attended. In Columbus, this fuelled speculation about the state of her health. In the home opener of the 2009 season, Chris Spielman (who was set to be inducted into the college football Hall of Fame the following summer) was honored at halftime with his family. It was only two and a half months before she passed away. I was at the game today. I was too young to remember Chris Spielman’s playing days at Ohio State, but when Stefanie was diagnosed with cancer, my life revolved around Buckeye football. This story always had my attention. It’s always hit close to home for me, due to my love of Ohio State football, Columbus, and for another important reason. 14 months after the Spielman’s went public with Stefanie’s battle, in September of 1999, my mother was diagnosed with breast cancer. Like Stefanie, my mom was only in her 30’s, younger than the recommended age when women are encouraged to start getting mammograms. Unlike Stefanie, the cancer had not spread to my mother’s lymph nodes. I didn’t know anything about breast cancer then but I never really worried than anything bad was going to happen to mom. Maybe it was denial, or maybe all 13 year olds are naive. Reading Chris Spielman’s account of the early battle with cancer, and events like relatives trying on the whig brought back memories of my mother’s own battle with cancer that I hadn’t really thought about in a very long time. Thankfully, my mom’s doing good today. She’s been cancer free for over a decade. Everyone has been impacted by cancer. Either from first hand experience or from seeing a relative or friend go through it. “That’s why I’m here” is a book that everyone can relate to. Even though this story doesn’t end how anyone would have wanted, in the end, the book leaves you with a sense of hope and optimism. I never had the opportunity to meet Stefanie Spielman, but this book left me feeling like I knew her personally; and it will leave you inspired by her example and wanting to be a better person.